RealChoice: Down syndrome gets positive press in the Washington Post! 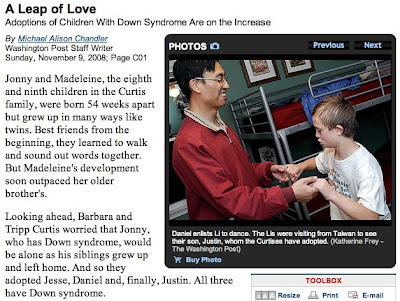 Down syndrome gets positive press in the Washington Post! Looking ahead, Barbara and Tripp Curtis worried that Jonny, who has Down syndrome, would be alone as his siblings grew up and left home. And so they adopted Jesse, Daniel and, finally, Justin. All three have Down syndrome. For many parents, a diagnosis of Down syndrome can be overwhelming as they face the likelihood that the child will struggle to live independently and require intensive medical, financial and social support. Most prenatal diagnoses of Down syndrome lead to abortion. Yet almost 200 families are on a waiting list to adopt a child with Down syndrome in the United States. Others are seeking to adopt such children overseas. Many of those interested in adoption, such as the Curtises, have a child with the genetic condition; some are special-education teachers or motivated by religious beliefs or idealism. PS. The article gives a clue as to Barbara's legitimate ex-hippie credentials. Her daughters' middle names are Sunshine and Moonbeam.